A bone graft is defined as implanted material, used alone or in combination with other material(s), to promote bone healing through osteogenesis, osteoinduction, and osteoconduction[1-4]. them is time-consuming during surgery. 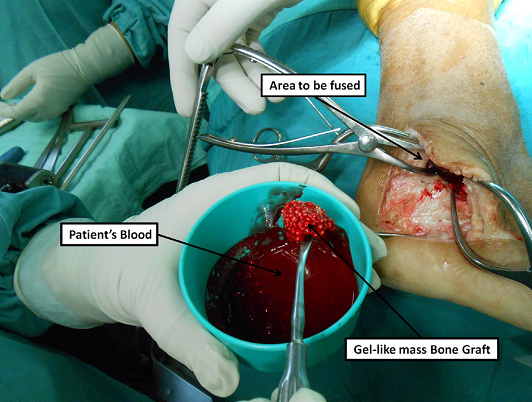 During surgery, we have drawn blood from the patient and added it to the bone graft particles in order to contain these particles in the fusion area. The aim of this article is to describe this technique. Hemostasis is the process of blood clot formation. When blood vessel walls are disrupted, the clotting process begins rapidly and is localized. The mechanism of coagulation starts with activation, adhesion, and aggregation of platelets with sequential activation of enzymes resulting in significant stepwise response amplification. The results of local generation of fibrin, enmeshes and reinforces the platelet plug. Clot formation is the initial response to stop bleeding, followed by clot lysis and tissue remodeling [6,7]. from inflammatory and strength limitations [8,9]. bone. PEEK implants are also resistant to heat and ionizing radiation, minimizing concerns with thermal conduction near the brain and toxicity. PEEK can be sterilized repeatedly by steam and gamma irradiation . Finally, PEEK also facilitates critical postoperative diagnostic monitoring of oncologic and neurogical patients, because it is translucent to X-rays and is nonmagnetic, generating no artifacts in CT or MRI . Osveh Asia Medical Instrument Co. is the first Iranian company to make implantable products using PEEK for the sports medicine industry. PEEK Interference Screw, PEEK Tendonitis Screw and PEEK Anchor Sutures is made of VESTAKEEP (by Evonik). M. Sabri, N. Meir, P. Ezequiel. Bone graft substitute prepared with the patient’s blood. Technical tip, The Foot 25 (2015) 277–279. Oryan A, Alidadi S, Moshiri A, Maffulli N. Bone regenerative medicine: classic options, novel strategies, and future directions. J Orthop Surg Res 2014. Elsalanty ME, Genecov DG. Bone grafts in craniofacial surgery. Craniomaxillofac Trauma Reconstr 2009;2:125–34. Albrektsson T, Johansson C. Osteoinduction, osteoconduction and osseointegration. Eur Spine J 2001;10:S96–101. Coughlin MJ, Grimes JS, Kennedy MP. Coralline hydroxyapatite bone graft substitute in hindfoot surgery. Foot Ankle Int 2006;27:19–22. Furie B, Furie BC. Mechanisms of thrombus formation. N Engl J Med, 2008, 938–49. Lillicrap D, Key N, Makris M, O’Shaughnessy D. Practical hemostasis and thrombosis. Wiley-Blackwell; 2009, ISBN 1-4051-8460-4. p. 1–5. S. Rupp, R. Seil, A. Schneider, D.M. 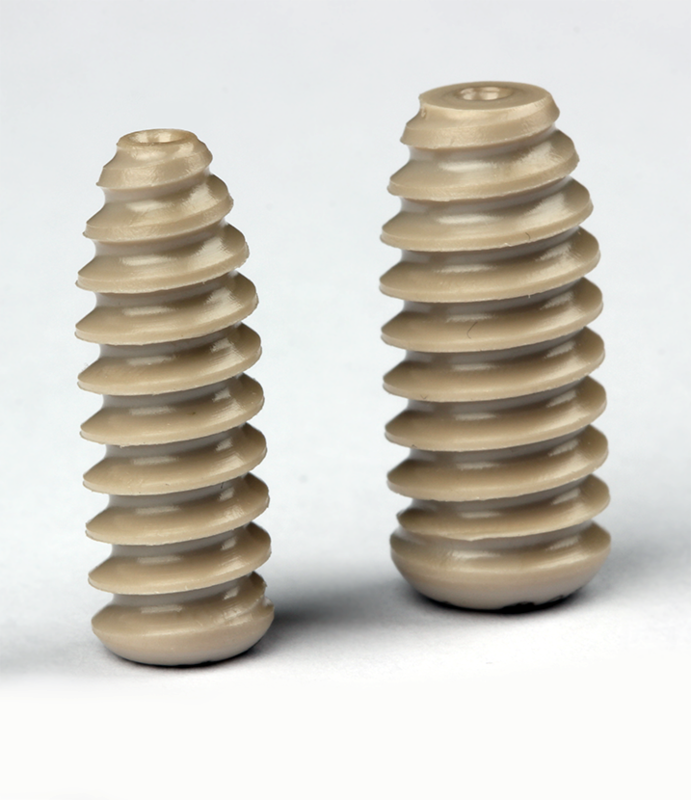 Kohn, Ligament graft initial fixation strength using biodegradable interference screws, J Biomed. Mater. Res. 48 (1) (1999) 70e74. D.G. Nagarkatti, B.P. McKeon, B.S. Donahue, J.P. Fulkerson, Mechanical evaluation of a soft tissue interference screw in free tendon anterior cruciate ligament graft fixation, Am. J. Sports Med. 29 (1) (2001) 67e71. M.M. Hanasono, N. Goel, F. DeMonte, Calvarial reconstruction with polyetheretherketone implants, Ann. Plast. Surg. 62 (6) (2009) 653e655.